Albert D. Barner, 80, of Camp Point, died at 6:46 a.m. Wednesday, March 20, 2019, at his home. Born July 28, 1938, in Pekin, Al was a son of Ira and Ruth Greaser Barner. He married Darlene A. Swogger on July 8, 1961, in New Middletown, OH. She preceded him in death on March 8, 2005. Al served his country in the US Navy. He was a member of the Camp Point VFW Post #5410 and the Camp Point United Methodist Church. He enjoyed spending time outdoors especially waterfowl hunting. 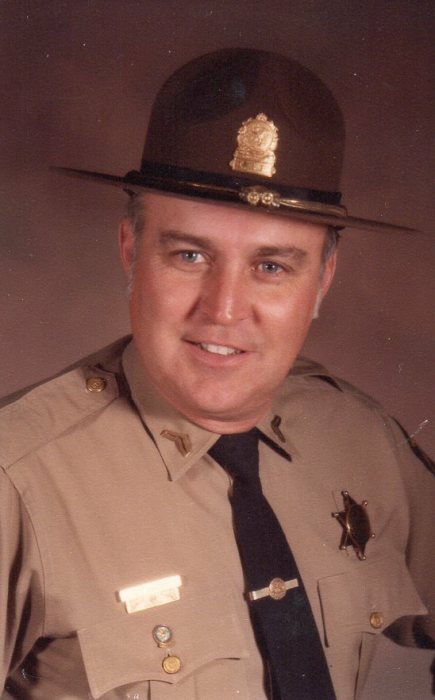 Mr. Barner was an Illinois State Trooper for 30 years retiring as a Master Sergeant in July of 1993. Survivors include four sons, Kenneth A. Barner (Cindy), Quincy, Jeffrey A. Barner, San Bernadino, CA., John M. Barner (Renee), Camp Point, and James A. Barner, Minneapolis, MN. ; ten grandchildren, Kelsey Barner, Ann Barner, Ava Barner, Jeffrey Barner, Justin Barner, Riley Barner, Cora Barner, Chase Barner, Kaylee Barner and Emily Barner; and two sisters, Addie Fischer (Kenny), Pekin, IL., and Mary Graber (Jerry), Pekin, IL. He was preceded in death by his parents, his wife, and two brothers, John, and Ira Barner. Funeral Services will be conducted at 10:00 a.m. Monday, March 25 at the Camp Point United Methodist Church by Rev. Sheila Kelly and Rev. Ronald Graham. Burial with military honors will follow at Evergreen Cemetery, Camp Point. Visitation will be held Sunday evening from 4:00 p.m. until 6:00 p.m. at the Camp Point United Methodist Church. Memorial contributions may be made to the Wounded Warrior Project or the Illinois State Police Heritage Foundation.